It’s not just the hair on your head that sometimes has a life of its own. 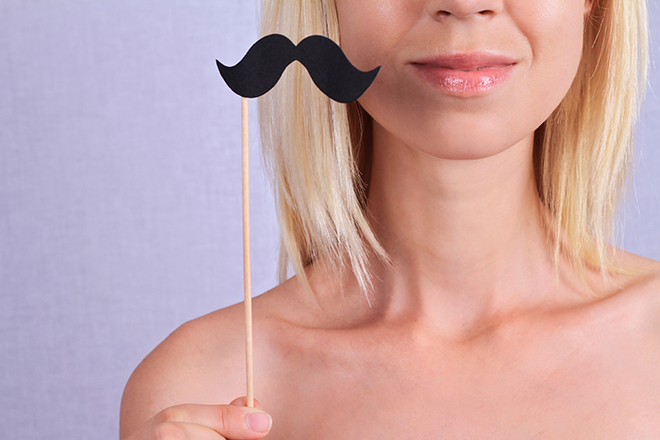 We need to talk about the secret sneaky life of facial hair! You went to bed looking like the sleeping beauty that you are and then you wake up in the morning with a black chin hair that’s long enough to make a wicked witch proud. Only you don’t notice it until you’re at work and it starts a slow drip down your neck because it was dangling in your coffee or on a date, because #life. We’ve all been there so here are some options for getting rid of that fine face fuzz, ‘taches and chin hairs temporarily or for good. When you wax, you pull your hair out from the root by applying the sticky stuff to the surface of your skin and peeling it (the wax and the hairs together) off in the opposite direction to that of your hair growth. Your kit would include ready-to-use wax strips like Nair Argan Oil Ultra Precision Roll-On Wax for Face and Eyebrows, R189,95, or hot wax that you can heat up in your microwave when needed. We recommend Sorbet Microwaveable Film Wax, R179.95. 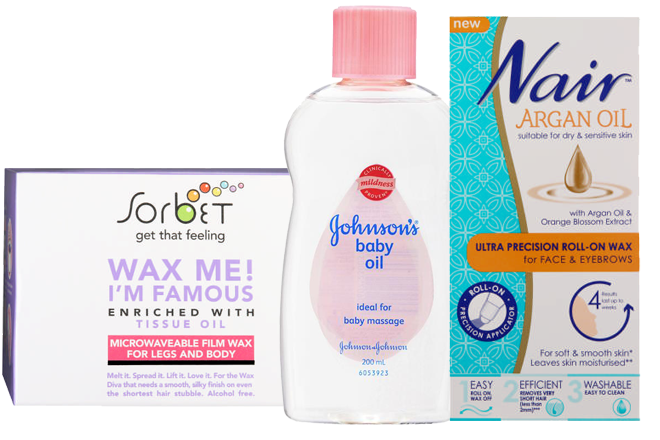 Waxing is messy but some packs include wipes for removing any excess wax and soothing sensitive skin, or you could use Johnson’s Baby Oil, from R34,95. But there is the eina factor to consider and to be perfectly honest we’ve never mastered the DIY version and end up popping into a salon. Cost: Brow and lip wax at a Sorbet Salon, R135. This specific technique originated in India and has now become super popular in South Africa. This hair removal technique is not just for your brows but can be used to remove other facial and bodily hairs. Also known as fatlah or khite, which are Arabic words for threading, it is a great alternative to waxing and offers less damage to the skin. Eyebrow threading involves using a thin piece of cotton and twisting it into a double stranded thread. This thread is then used to pick up a line of hair and remove it. The beautician may want to tidy it up more by trimming the hairs and brushing them after the process. This technique allows for a quick, precise, clean hairline. Another added benefit is that it removes the hair from the follicle; therefore it offers longer lasting effects. You would need to go for a repeat visit after about four weeks. Cost: Brow and lip threading at EyeCandyBrows in Woolworths, R200 (R120 for brows, R80 for top lip). Hair removal creams aka chemical depilatories are either rubbed or sprayed onto your skin to dissolve your hair’s protein structure, loosening your hair from the follicle and making it weak enough to be rubbed and washed off. Lotions, gels, roll-ons and aerosols are also available. Your hair is removed from just below the surface of your skin, so you won’t feel stubble as soon as after a shave. Be sure to conduct a patch test and follow the instructions carefully. 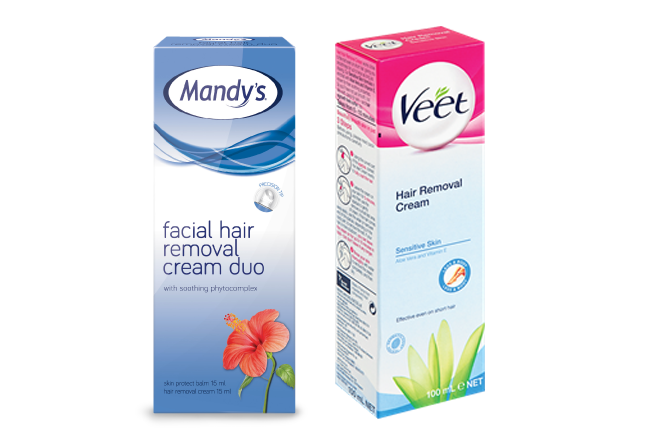 For above the neck, we recommend Mandy’s Facial Hair Removal Cream Duo, R49,95 and for bodies the Sensitive Skin Lotion Hair Removal Cream from Veet, R84. This method of hair removal is similar to waxing in that it uses an all-natural paste or gel made from food-derived ingredients (like sugar, water and lemon juice) to remove hair from the root. Although we’ve never tried this method ourselves, sugaring is apparently suitable for removing fine hair all over the body – with the exception of eyebrows, as that area is highly sensitive and threading would hurt less. It comes recommended for those with sensitive skin and blonde peach fuzz as it’s less likely to cause irritation. A possible con is having to grow out your moustache as the hair must be at least roughly 6mm long so that the gel is able to bind to the hair and pull it out at the root. There are few of salons that offer this treatment (we recommend this route obviously) but it is possible to do at home yourself. Watch here for a recipe and instructions. Just remember to let the mixture cool for over 20 minutes, it needs to be room temperature for obvious burning reasons. Make sure the area you plan on removing hair is well exfoliated and not oily. You can clean up any residue from sugaring with water since all of the ingredients in the mix are natural. Post-treatment avoid hot water, exfoliation, gym activity and the sauna for two days. The golden word to keep in mind is: ‘sparingly’. Tweeze most sparingly above and below your brows (or preferably not at all) – if you look pleasantly surprised even when you’re not actually, you’ve gone too far. Seriously, though, plucking above or below your brows can make your face look more feminine, so if that’s the look you’re going for, go ahead; if not, your best bet is to take it easy and try it over a few days, a little at a time. Less is more. Also, you’re only as good as your tools, so invest in one with a flat, slanted tip for the particularly accurate plucking. 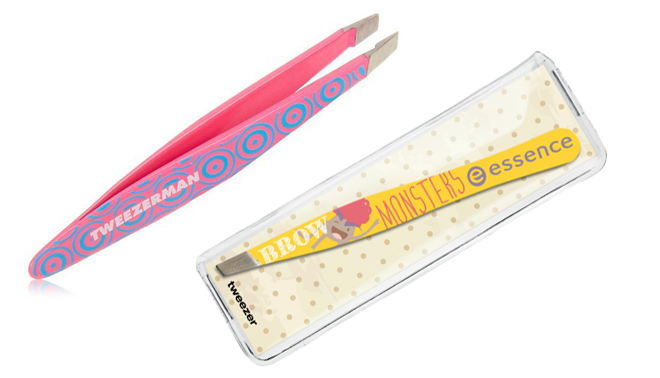 We’ve been using and loving our Tweezerman Neon Mini Slant, R225 from Dis-Chem for the last year, but you could also try the essence “little eyebrow monsters” tweezer, R38,95 (available from June 2017). The laser hair removal process involves directing highly concentrated beams of light onto your skin at a temperature that damages hair follicles and prevents regrowth while avoiding injury to the surrounding tissue. The result is permanent hair reduction. Six to 10 sessions are typically required for total hair removal in the treated area. The equipment used depends on your hair density, hair colour and skin type. The diode laser has a wavelength of 810 nanometer (nm), which is suitable for most patients’ hair. An alexandrite laser has a wavelength of 755nm, it’s a smaller wavelength used to target lighter hair colour. The Nd:YAG technology has a wavelength of 1064nm, and this is usually used for darker skin types and hair colours. These lasers are generally safe for use on all parts of the body. IPL, or intense pulse light, is similar to laser, however, laser uses one wavelength of light, while IPL uses the full spectrum. IPL systems have filters in them that block out the wavelengths that are not needed for that particular treatment. For example, if the goal is hair removal, your therapist will cut out the wavelengths that don’t target the melanin (pigment in hair). IPL’s wavelengths are more diffused and therefore somewhat less powerful than laser, however, both modalities can be effective. The risk complications are low, but the most important thing here is choosing a trained and qualified technician. For an understanding of which one is right for you, visit an experienced practitioner. Cost: Top lip permanent hair removal from R400 per session at branches of the Skin Renewal Aesthetic Clinics. The price tag may sound hefty, but a quick sum shows that R2 400 works out a lot more cost effectively in the long run. Like waxing, epilators also remove hair from the roots, except instead of using wax to do so, these electrical appliances have mini tweezers on a roller that revolves at a high speed along the surface of your skin, trapping your hairs and pulling them out. I must confess to a life-long fear of these after watching my sisters and aunts wield their trusty Epilady’s in my youth with varying results and much tortured screaming. 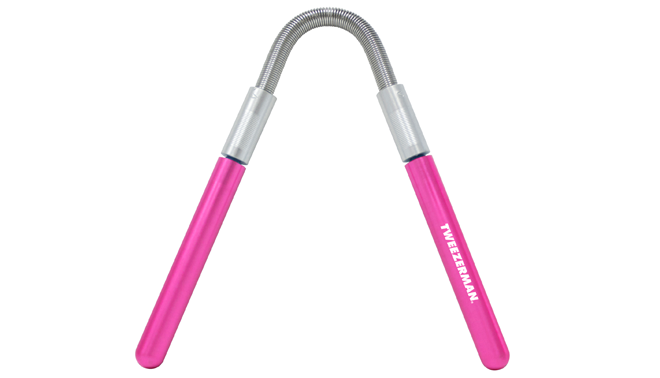 But I was brave enough to try the Tweezerman Smooth Finish Facial Hair Remover, R369 from Dis-Chem (it also comes with a free Slant Tweezerette). First looks can be deceiving and initially, it doesn’t look easy to use, but once you get the hang of it, it’s as effective as threading, and a bit less painful. Place the flat side of the coil against your skin, then twist the knobs above the blue or pink handles in the direction of the arrows printed on them to pull out the hair. Can be used on unwanted hairs on the neck, chin, cheeks and upper lip. I am going to try coil epilating, i usually tweeze and thread. I WAX AS WELL AS THREAD.I PREFER TO WAX MY UPPER LIP. I FIND THAT THREADING MY EYEBROWS REALLY DEFINE THEM. I use tweezing, have always been scared of waxing and did not know what the right product was to use, but learnt a lot from this article, so will be sure to try this different methods. The Coil Epilating looks interesting. I just cannot seem to get the hang of the microwavable wax. I am used to wax strips now, I heat it up with a blowdryer. I use hot wax at home for waxing my upper lip..it works very well for me and I just apply some baby oil afterwards to avoid any irritation. I personally love threading! Yes, it is a bit of a painful method but I’ve noticed that the hair growth declines over a period of time. Hair removing creams are very good to use if you don’t have much time on your hands and you’re running late. I like using the Mandy’s Facial Hair Removal Cream Duo and No Hair Hair Removal. They are definitely good buys! Does anyone know of a permanent treatment for hair removal other than laser that doesn’t hurt and isn’t too expensive? Naomi, you really have to read this article: http://beautysouthafrica.com/skin-and-body/treatment-of-the-month-soprano-ice-laser We’re on our third session, and it really doesn’t end up costing that much. Even threading is getting super expensive these days. Most of these methods are effective but painful for me. I absolutely hate removing my facial hair. I currently wax but I find it painful. I will try the facial remover cream. I am sticking to waxing, beats shaving by far and as you go on hair grows slower and less! Ouch the coil seems painful. I use Mandy’s facial hair remover cream! Love it! And it is painless which is a plus side for me. Threading is awesome. The regrowth diminishes with time. I have tried most of these in the past but I feel like tweezing works the best for me. I do have facial hair that I just want gone! Good options to try. I do want a permanent option though.